Research recently released by Australian Hearing shows that its long-term collaboration with local communities and service partners, has helped to reduce the age hearing impaired Aboriginal and Torres Strait children receive their first hearing aids. Now one in four children receive their first hearing aids before the age of five, compared to one in 10 in 2008. 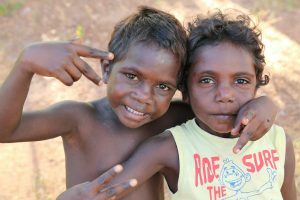 Australian Hearing has tracked Aboriginal and Torres Strait Islander children’s hearing aid fitting data for the past 10 years discovering in 2008, that only 10% of children with hearing aids received them before age five. “This was a real concern for us as it meant that many children were missing out on developing crucial speech, language and listening skills,” said Samantha Harkus, Principal Audiologist, Aboriginal and Torres Strait Islander Services, Australian Hearing. “In 2017, we commissioned social research to understand what Aboriginal and Torres Strait Islander parents and carers know and believe about hearing loss and hearing aids in children aged five years and under. “These findings will influence how our outreach audiologists work with communities, building stronger relationships with early childhood services and child and family health nurses. The research continues to shape our services and our messages to families to continue to reduce the age of first hearing aid fitting,” added Samantha. This long-term collaboration with local communities is now showing solid results. The 2017 data just released indicates that one in four Aboriginal and Torres Strait Islander children who need hearing aids, now receive them before the age of five. This is a significant improvement from one in ten children in 2008. The Australian Hearing Outreach Program focuses on improving access to hearing services for Aboriginal and Torres Strait Islander people through the building of strong community connections. These services are delivered under Australian Hearing’s Community Service Obligation (CSO) program, funded by the Department of Health. In more than 230 communities in urban, rural and remote areas across the country, and with over 100 audiologists, the program delivers hearing aid and support services to a steadily increasing number of clients each year. Australian Hearing’s commitment to find ways of connecting with families earlier, led to the proposal of a joint trial of a new tele-fitting approach, TeleFIT, to the Queensland Aboriginal Hearing Health program in 2016, called Deadly Ears. This approach has significantly reduced waiting time and increased the number of children receiving hearing aids before they start school. The Australian Hearing TeleOutreach program has recently expanded with the launch of a six-month Tele Follow-Up trial. This will lead to earlier follow up for all children receiving their first hearing aids in remote communities, through check-ins via video-chat.